When you think of Malibu you often think of movie stars, beaches and Ferraris not mountains and canyons but Malibu has a lot more of the later than the former. Solstice Canyon lies deep in the heart of Malibu, miles and miles up the PCH but not quite Ventura this place offers trails for everyone. There is a flat, mostly paved trail that will take you from the parking lot to a crazy burned out house (more on that later) but because I and my hiking compatriots were looking for a challenge, we decided to hike the Rising Sun trail and then continue on the Deer Park loop. The effort you make on this trail are well worth it though as you make your way up canyon, the Pacific opens up and gives you some killer views. 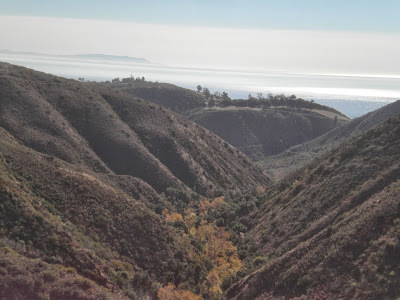 As you get up higher and hug the canyon walls the other mountains of Malibu reveal themselves. what is fascinating is that all the chimneys remain and that there were several houses in the canyon, all wiped out by fires over the years. This canyon, while beautiful, is not a place to build a house. Then the long slog out of the canyon up to a saddle which overlooks Malibu. To get to this point requires a bunch of toiling up and down gullies with very little shade to speak of. I am not going to lie, the uphills are a bit demoralizing. Much like Kim Kardashian's celebrity status (zing!). Finally you get to the top and the whole Pacific Ocean, the mountains, the celebrity enclaves all open up before you! What was the best part of this hike, you might ask? Well I am glad you did cause I will tell ya. Sure, it isn't exactly Vermont but this Upstate boy takes what he can get out here in SoCal. Overall the trail was 8 miles (plus an extra .5 due to the parking situation, there aren't a lot of spots) and while tough in parts, the views will make it worth it. Am I a fan? I am a fan!